Another study just linked chronic fatigue syndrome to gut bacteria. Cancer comes in many different forms, and it is not unusual for diagnosed patients to endure multiple kinds of treatments before one that is effective against their particular form of cancer is found. If it takes too long for doctors to find the right treatment, the consequences can be fatal. The severity of cancer has fuelled physicians and scientists from all walks of life to explore any possible solution, including those that seem natural to those that may at times seem unconventional. Well, researchers are now taking vaccines, which typically target viruses and bacteria, and reworking them to zero in on the patient’s specific cancer cells. Physicians and scientists led by Catherine Wu at the Dana-Farber Cancer Institute in Boston just presented their results of their new cancer therapy to the American Association for Cancer Research (AACR) in Washington, DC. Their personalised vaccines have prevented early relapse in 12 patients with skin cancer, while also boosting patient immunity when combined with a cancer drug. While earlier cancer vaccines targeted a singular cancer protein found ubiquitously among patients, these personalised vaccines contain neoantigens, which are mutated proteins specific to an individual patient’s tumour. These neoantigens are identified once a patient’s tumour is genomically sequenced, providing physicians with the information they need to pinpoint unique mutations. Once a patient’s immune system is provided a dose of the tumour neoantigens, it can activate the patient’s T cells to attack cancer cells. Unlike previous attempts towards cancer vaccines, which did not produce conclusive evidence in halting cancer growth, Wu’s team made their personal vaccine much more specific to each patient’s cancer, targeting about 20 neoantigens per patient. The vaccines were injected under the patients’ skin for a period of five months and indicated no side effects and a strong T cell response. All of Wu’s patients who were administered the personal vaccine are still cancer-free more than 2.5 years after the trial. However, some patients with an advanced forms of cancer also needed an some extra punching power to fend off their diseases. Two of Wu’s patients who did relapse were administered an immunotherapy drug, PD-1 checkpoint inhibitor, in addition to the personalised vaccine. Working in conjunction with the enhanced T cell response from the vaccine, the drug makes it difficult for the tumour to evade the immune cells. The fusion of the two therapies eliminated the new tumours from both patients. But we can’t get too excited yet. While these results are promising, the therapies are relatively new and require much more clinical testing. Many physicians around the world are working together to test the potency of neoantigens in order to verify if the vaccine works better than current immunotherapy drugs over a sustainable period of time. Personalised vaccines are costly and take months to create, a limiting factor in providing care to patients with progressing cancers. Still, this study is an encouraging sign for many oncologists who are interested in using the immune system to fight cancer. More than a million new patients are diagnosed with cancer each year in the U.S. alone, and even in situations where the cancer is treatable, the available chemotherapy agents themselves can be very toxic. If proven safe and effective, this personalised cancer vaccine could give patients around the world hope for powerful treatment with fewer side effects. The internet is freaking out over this spooky prediction by Carl Sagan about the future. Back in 1995, everyone’s favourite astrophysicist, Carl Sagan, published a book called The Demon-Haunted World, which warned against the dangers of pseudoscience and scientific illiteracy, and encouraged its readers to learn critical and skeptical thinking. Pretty standard stuff for a socially conscious scientist, but one passage in particular has been blowing up on Twitter this week, and it’s not hard to see why. Somehow, (we’re not saying time machine, but probably time machine) Sagan managed to predict the state of things as they are today – and it’s unnervingly accurate. We’re talking the decline in manufacturing jobs; people feeling hopeless about politics; politicians refusing or unable to represent the public interest; and brilliant, revolutionary technologies that never seem to change the lives of anyone but the 1 percent. The result? Sagan predicts people will opt for superstition and pseudoscience over reality – and even more concerning, he says the public will be intellectually incapable of distinguishing between what makes us feel good, and what’s actually true. Fake news, anyone? So did Sagan somehow know enough about society in 1995 that he could accurately predict what life would be like in a couple of generations, or are we all reading too much into it? Oddly enough, the way we interpret this kind of prediction actually has a lot to do with how we interpret horoscopes – one of Sagan’s biggest bugbears. Horoscopes have nothing to do with reality, but they owe their enormous success to the fact that humans tend to see what they want to see. So while we can be pessimistic about the future of society as a whole, humans are generally pretty optimistic about their individual future prospects – a concept known as optimism bias. It’s actually an evolutionary survival tactic – and that’s something horoscopes directly tap into. Thanks to humanity’s optimism bias, you could show someone all the statistics related to divorce, cancer, and average lifespan, and more often than not, they’ll choose to believe that those negative experiences won’t happen to them. So when we see horoscopes that tell us we’re going to meet our soulmate or get a big promotion this month, we choose to believe it, and don’t tend to go back and fact-check it – the horoscope has already done its job by making us feel good. A similar thing goes on when we’re presented with a spookily accurate prediction of the future – part of the cognitive bias that’s wired into all humans is that we are drawn to details that confirm our existing beliefs. We also need to put these predictions into context, because once you read past the viral passage, you’ll see that Sagan is kinda trying to blame the state of things in the future on… Beavis and Butthead? “The dumbing down of America is most evident in the slow decay of substantive content in the enormously influential media, the 30-second sound bites (now down to 10 seconds or less), lowest common denominator programming, credulous presentations on pseudoscience and superstition, but especially a kind of celebration of ignorance. How delighted Sagan would be to know that in 2016, more young people were watching David Attenborough than The X Factor. Mind-numbing television is actually the least of our problems right now. But even with all that said, we do have to give props to Sagan for coming up with a really cracking prediction for the beginning of 2017. Let’s hope for better things to come in the months and years ahead. What we learned from gruesome decapitation experiments. Almost two decades later, Soviet scientist Sergei Brukhonenko reportedly kept a dog’s severed head alive for nearly six months using a primitive heart-lung machine. But while Brukhonenko’s research may have been an important in the development of cardiac surgery – it is more often regarded as faked Soviet-era propaganda. In 1995, Francis Crick wrote in The Astonishing Hypothesis that we are nothing more than an “immensely complex collection of neurons”. In a 2011 experiment, it was reported that decapitated rats’ time to unconsciousness – defined by a decrease in cognitive activity of 50 percent – was 4 seconds. The researchers also observed a very large and much later slow wave in brain activity. This was interpreted as what they called a “wave of death” – when all the brain’s neurons died at the same time – and perhaps, the ultimate border between life and death. Furthermore, some philosophers and scientists have suggested that “information may be the key to consciousness“. Consistent with this idea is integrated information theory, which accepts the existence of consciousness, but controversially implies that anything at all may be conscious – even a smartphone – if it possesses a sufficiently high “phi”: a measure of information in a system which cannot be reduced to that specified by its parts. Higher vagus nerve function (measured and indexed by heart rate variability) supports a person’s capacity for emotion regulation, social engagement and cognitive function. Studies have also suggested that the vagus nerve might play an important regulatory role over inflammatory processes, contributing to diabetes, obesityand cardiovascular disease – all of which also impact on cognitive function. That’s why I teamed up with colleagues to question whether previously reported relationships between vagal function and cognitive performance could be explained through a single neurological-psychological-physiological pathway. While simple health behaviours – weight loss and exercise for example – may ‘short circuit’ adverse effects on brain function, more research into the causal pathways involved is still needed to discover just how the vagus nerve connects the body, brain and mind. But it is one step on a path that we hope will develop with our own research into “positive psychology” for people living with neurological disorders. Astronomers have detected an atmosphere around an Earth-like exoplanet called Gliese 1132b (GJ 1132b for short), which is located around 39 light-years away in the constellation Vela. This is the first time atmosphere has ever been detected around a planet with a mass and radius so similar to Earth’s, and that makes it a hugely promising (and exciting) target for researchers searching for signs of extraterrestrial life. “While this is not the detection of life on another planet, it’s an important step in the right direction: the detection of an atmosphere around the super-Earth GJ 1132b marks the first time that an atmosphere has been detected around an Earth-like planet other than Earth itself,” said lead researcher John Southworthfrom Keele University in the UK. There’s still a lot to learn about GJ 1132b’s atmosphere, but early observations suggest it could be a “‘water world’ with an atmosphere of hot steam” – AKA, a pretty awesome place to go looking for life. So far, we know that GJ 1132b has a mass about 1.6 times that of Earth’s, and has roughly 1.4 times its radius – which in terms of exoplanets makes it remarkably similar to our home planet. But as with all exoplanet discoveries, the researchers are quick to remind the public that the observations to date still really don’t give us much insight into how similar GJ 1132b could be to Earth – or how habitable. Some bad news upfront is it has an estimated surface temperature of 370 degrees Celsius (698 degrees Fahrenheit), which makes it unlikely that it could host life like us. And let’s not forget that we’ve recently been burned by the detection of the TRAPPIST-1 ‘sister solar system’ and neighbouring Earth-like planet Proxima b, both of which are unlikely to be the friendly places for life we first thought they were. But none of those planets had ever gotten as far as having an atmosphere detected, so GJ 1132b is already doing pretty well in terms of a spot that could potentially host life. Right now, the top strategy for astronomers in the search for life on another planet is to detect the chemical composition of that planet’s atmosphere, looking for certain chemical imbalances that could hint at the presence of living organisms. For example, on Earth, the large amount of oxygen in our atmosphere is that ‘smoking gun’. We’re a long way off having that much insight into GJ 1132b, but the fact that we’ve detected its atmosphere at all is a good first step. The planet orbits the not-too-distant red dwarf star Gliese 1132, which Southworth and his team studied using the ESO/MPG telescope in Chile. They measured the slight dip in brightness across seven wavelengths of light as GJ1132b passed in front of its host star every 1.6 Earth days, in order to get a better idea of the size and composition of the planet. They were surprised to find that the planet appeared larger when observed in one type of infrared wavelength of light, which suggests that the planet has an atmosphere that’s opaque to these wavelengths. The team went on to model different possible versions of this atmosphere, and found that an atmosphere rich in water and methane could explain what they were seeing. Prior to this, the only exoplanets that researchers have detected atmospheres around were planets that were more than eight times more massive than Earth, and gas giants similar to Jupiter. The type of star GJ 1132b is orbiting also makes the planet of particular interest – its host star is a low-mass red dwarf, which are incredibly common throughout the Universe and are frequently found to host small, Earth-like planets. But they’ve also been shown to be particularly active, often blasting huge solar flares out at their surrounding planets – something previous research has suggested would evaporate any traces of a planet’s atmosphere. But the new discovery suggests that an atmosphere is possible of enduring this bombardment for billions of years without being destroyed – which opens up the possibility that thousands more planets orbiting low-mass stars could potentially harbour atmospheres. “Given the huge number of very low-mass stars and planets, this could mean that the conditions suitable for life are common in the Universe,” a press release explains. We still have a lot to learn about GJ 1132b, and hopefully we’ll have some more answers soon – the new discovery makes it one of the highest-priority targets to be studied by instruments such as the Hubble Space Telescope, the Very Large Telescope, and the James Webb Space Telescope, which is scheduled to launch in 2018. Meditation and the psychedelic drug ayahuasca seem to change the brain in surprisingly similar ways. At the end of a dark earthen trail in the Peruvian Amazon stands a round structure with a thatched roof that appears to glow from within. In the Temple of the Way of Light, as it is known, indigenous healers called Onanya teach visitors about the therapeutic uses of ayahuasca, a hallucinogenic brew that’s been used by locals for thousands of years. Amanda Feilding, the founder and director of the UK-based nonprofit Beckley Foundation, collaborates with scientists around the world to understand how psychedelic drugs affect the brain. Feilding describes decentering as “the ability to objectively observe one’s thoughts and feelings without associating them with identity”. Decentering might sound esoteric, but it’s one of the key aims of mindful meditation and is also a goal of successful depression treatments in some cases. In volunteers who’ve taken ayahuasca as part of Beckley’s research, decentering has been linked with higher scores on questionnaires designed to measure well-being and happiness and lower scores on measurements of depressive or anxious thoughts and symptoms of grief. “It’s interesting because even though our research out of Peru is based on surveys, while in Barcelona it’s based on more traditional scientific research, our results out of both places are showing an increase in these traits,” Feilding says. Since the findings out of Peru are based on surveys, they can’t prove that ayahuasca caused the reduction in symptoms of depression and grief – only that there’s a connection between the two. But in Spain, as part of a collaboration between Beckley and Sant Pau hospital, neurologist Jordi Riba is looking at the brain activity in depressed volunteers who are given ayahuasca. His findings indicate that in addition to people simply reporting that they feel more decentered and less depressed after taking ayahuasca, there is a corresponding neurological change in their brain activity. One small study of 17 depressed volunteers who took ayahuasca saw a decrease in activity in areas of the brain that tend to be overactive in conditions like depression and anxiety. And a new study of regular ayahuasca users suggests a physical shrinking in these parts of the brain, though that work has not yet been published in a peer-reviewed journal. These findings are bolstered by other research on the potential therapeutic effects of psychedelics. Studies out of New York University and Johns Hopkins suggest that the psychedelic drug psilocybin – the ingredient in magic mushrooms – elicits similar effects among depressed people. “With the psilocybin, you get an appreciation – it’s out of time – of well-being, of simply being alive and a witness to life and to everything and to the mystery itself,” Clark Martin, a patient who participated in one of the Johns Hopkins trials, previously told Business Insider of his experience. David Nutt, director of the neuropsychopharmacology unit at Imperial College London, has been working with Feilding, and says the brains of people with depression or addiction get locked into patterns of thinking driven by the brain’s control centre. “Psychedelics disrupt that process so people can escape,” he says. This New Smartphone Screen Material Can Repair Its Own Scratches. Chemists at the University of California, Riverside, have invented what could become a third option: a phone screen material that can heal itself. The researchers conducted several tests on the material, including its ability to repair itself from cuts and scratches. After they tore the material in half, it automatically stitched itself back together in under 24 hours, Chao Wang, a chemist leading the self-healing material research, tells Business Insider. The material, which can stretch to 50 times its original size, is made of a stretchable polymer and an ionic salt. It features a special type of bond called an ion-dipole interaction, which is a force between charged ions and polar molecules. This means that when the material breaks or has a scratch, the ions and molecules attract to each other to heal the material. This is the first time scientists have created a self-healing material that can conduct electricity, making it especially useful for use for cell phone screens and batteries, Wang says. Some LG phones, like the G Flex, already include a similar material on its back covers that can self-heal scratches. But this material can’t conduct electricity, so manufacturers can’t use it for screens. Most phone screens have a grid of electrodes underneath, and when you touch it, your finger (which is also conductive) completes a circuit, telling the phone what to do. The team will present its research at an April 4 meeting of the American Chemical Society, the world’s largest scientific organisation devoted to the study of chemistry. “Self-healing materials may seem far away for real application, but I believe they will come out very soon with cell phones. Within three years, more self-healing products will go to market and change our everyday life,” he says. Our newly discovered ‘sister solar system’ – a seven-planet conga line orbiting an ultra-cool dwarf star called TRAPPIST-1 – has been hailed as a potentially habitable pocket of the Universe, flush with liquid water and temperate climates, and only 39 light-years away. But the closer we look, the less ‘alien-friendly’ this star system appears, with scientists now finding that TRAPPIST-1 is so volatile, either its three ‘Earth-like’ planets have one hell of a magnetosphere, or we’re looking at yet another set of uninhabitable worlds. A team led by astronomer Krisztián Vida from Konkoly Observatory in Hungary has been analysing luminosity patterns in the raw photometric data of TRAPPIST-1, obtained during the K2 mission of NASA’s Kepler space telescope. Over an 80-day period, they clocked 42 high-energy flares blasting from TRAPPIST-1, including five that were ‘multi-peaked’ eruptions, meaning they gave off several bursts of energy in one go. The strongest eruption the team identified was about as powerful as the largest flare we’ve ever witnessed from our own Sun – the infamous Carrington Event of 1859, which if it happened today, would devastate global communication systems. But if life on Earth can withstand flares like the Carrington Event, why can’t hypothetical aliens on TRAPPIST-1’s three Earth-like planets? The first thing to consider is that the average time between these flares was just 28 hours, so we’re talking serious and near-constant bombardment here. And the researchers go so far as to say the solar storms caused by TRAPPIST-1 ‘s flares would be hundreds or thousands of times more powerful than the storms that hit Earth. According to a separate study released last year, it would take 30,000 years for a planet’s atmosphere to stablise after one of these powerful flares – so they’re not getting much done in just 28 hours. “The frequent strong flares of TRAPPIST-1 are probably disadvantageous for hosting life on the orbiting exoplanets, as the atmospheres of the exoplanets are constantly altered and cannot return to a steady state,” the team concludes. Just to drive this depressing point home even further, Evan Gough over at Universe Today points out that Earth’s robust magnetic field protects us from the worst parts of the Sun’s flares, but it’s unlikely the TRAPPIST-1 planets have the same shield up. “This study suggests that planets like those in the TRAPPIST system would need magnetospheres of tens to hundreds of Gauss, whereas Earth’s magnetosphere is only about 0.5 Gauss,” says Gough. So things aren’t looking so great for our sister solar system. And while we’ve pretty much gotten used to the emotional roller coaster that is the search for life elsewhere in the Universe, this is a tough one, because remember that Google Doodle of our new planet friends? But if taken alongside previous studies that have already brought the system’s habitability into question, we might have to reconsider those awesome NASA travel posters, and come up with something more… Hellscapey. Confirmed: Those mysterious radio bursts really are coming from outer space. For almost a decade now, scientists have been trying to decode the origin of some of the most mysterious and explosive signals in the Universe – fast radio bursts (FRBs). Lasting only milliseconds, these bursts of energy are about a billion times more luminous than anything we’ve ever seen in our own galaxy, and seem to be travelling across vast distances. But despite having detected more than 20 of them, scientists still aren’t sure where they’re coming from, or what causes them. Now researchers are one step closer by ruling out any source on Earth. There are still several hypotheses out there that need to be ruled out before we can say for sure where FRBs do come from – perhaps the most bizarre one put forward by Harvard scientists last month is that the FRBs could actually be alien signals. But the fact that we now know the answer lies in space is a big deal. It might sound obvious, but let’s not forget that back in 1998, researchers thought they had discovered a new type of radio signal coming from space, only to figure out 17 years later that it was coming from a microwave oven in their research facility. The reason the origin of these radio signals is so hard to nail down is that we often find them using single-dish radio telescopes, which can ‘hear’ a lot without providing much perspective on where it’s coming from. “Conventional single dish radio telescopes have difficulty establishing that transmissions originate beyond the Earth’s atmosphere,” said one of the researchers on the latest study, Chris Flynn from Swinburne University of Technology in Australia. To overcome this problem and rule out terrestrial interference as the source of FRBs once and for all, the researchers used the Molonglo telescope in the Australian Capital Territory (ACT), which has a collecting area of around 18,000 square metres (194,000 square feet). This huge collection area means the telescope is ideal for picking up FRBs, but back in 2013, the team also realised that because of its architecture, it’s not possible for it to detect any signals coming from within our atmosphere. So the team set about hunting through Molonglo’s data to see if they could find any traces of FRBs – seeing as the telescope produces more than 1,000 TB of data each day, that’s no easy feat. The idea was that if the telescope had detected the signals, then they must be coming from outer space. Eventually, they uncovered three new FRB signals in the telescope’s data, which matched perfect with the signals we’ve picked up before – indicating that they couldn’t possibly be coming from Earth. Their conclusions back up findings from earlier this year, when researchers were able to pinpoint the source of a FRB to a tiny dwarf galaxy more than 3 billion light-years from Earth. 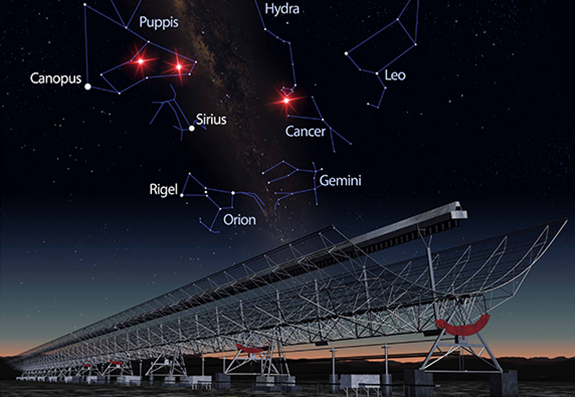 The Molonglo telescope is now being updated with the hope that it might be able to provide some more insight in future – hopefully even going as far as pinpointing specific galactic origins. “Figuring out where the bursts come from is the key to understanding what makes them. Only one burst has been linked to a specific galaxy,” said lead researcher Manisha Caleb.